2nd annual Celebrating the Women of Physical Science event at Belmont University in Nashville, Tennessee, November 5, 2018. 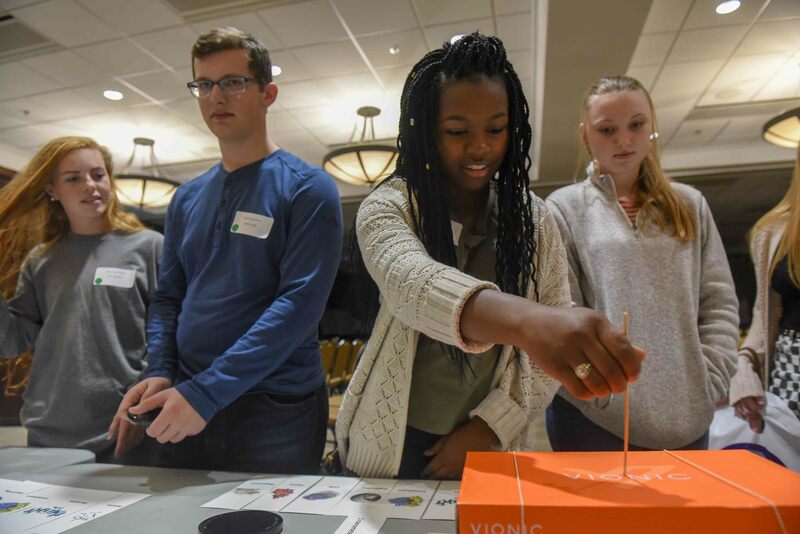 Belmont University’s Department of Chemistry and Physics hosted the 2nd annual Celebrating the Women of Physical Science outreach event on Monday, November 5. The event seeks to make the physical sciences relatable and accessible to high school students, exposing them to key equipment, materials and skills needed in science and math classrooms. This year, more than 60 students from 13 area high schools attended the event where they participated in lab tours lead by College of Science and Mathematics Dean Dr. Thom Spence, demonstrations and hands-on lab activities focusing on the relationship between physics and the human body lead by Belmont physics faculty Drs. Krista McBride, Davon Ferrara and Steve Robinson. Chemistry Professor Dr. Rachel Rigsby moderated a career panel where students had the opportunity to interact with professionals with backgrounds in science who have chosen a wide variety of career paths (commercial laboratories, scientific writing, law and research). Panelists included Kara Allen, director, recruitment and university relations at Aegis Sciences Corporation, Kate Payne, associate professor of nursing at The Center for Biomedical Ethics and Society at Vanderbilt University Medical Center, Dwayne O’Brien, instructor of music business at Belmont and Bailey Rose, graduate student in analytical chemistry at Vanderbilt University and Belmont alumna. The event ended with Dr. Hana Dobrovolny’s keynote address “Infectious physics: How physics can help us understand viral infections.” Dobrovolny currently serves as associate professor in the Department of Physics & Astronomy at Texas Christian University. She received her Ph.D. in physics from Duke University and discovered her interest in the interdisciplinary field of biophysics early in her career, pursuing projects researching neural signals for her Master’s degree and cardiac electrophysiology during her Ph.D. This was followed by a postdoctoral fellowship at Ryerson University where she began her research on infectious diseases. Her current research interests include mathematical modeling of viral infections and modeling of cancer treatment using oncolytic viruses. This event was organized by the Department of Chemistry and Physics STEM Outreach Committee (Rigsby, McBride, Ferrara) and Committee Chair and Assistant Professor of Chemistry Education Dr. Danielle Garrett who was extremely pleased with the success of the event this year. A number of Belmont students also assisted with the event including Christopher Hansen, Crystal Lemus, Avery Daniels, Maria Brauer, Mason Pohlman, Jacob Carney, Parker Anderson, Billy Mitchell and Erin Lawrence.